After it was revealed that Frank Ocean’s new album “Boys Don’t Cry” would be coming exclusively to Apple Music this Friday (5th August), Britney Spears just announced on Twitter that her new album "Glory" will be also coming to Apple Music exclusively on August 26th and the exclusive period will last 2 weeks. "It’s the best thing I’ve done in a long time. I’m proud of the work, and it’s very different; it’s not what you would think at all," Spears said of her new album in March. Apple Music songs are all DRM protected, no matter whether you've downloaded it or not. With the help of Sidify Apple Music Converter, you can easily remove DRM from Apple Music songs and copy the whole iTunes Music Library to portable devices, such as Android phone, Android Tablet, car player, MP3 or MP4 player. In this way, you can enjoy all your songs of Britney Spear anywhere and anytime. Even you have cancelled subscription from Apple Music, you can also enjoy them without limitation. Step 1: Download the album "Glory" o other songs of Britney Spears from Apple Music on your Windows or Mac. 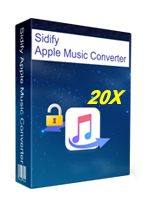 Step 2:Download Sidify Apple Music Converter on your Mac or Windows. Step 3:Remove DRM from these songs with the program, and then you will get DRM-free MP3. Step 4:Transfer the converted music to any devcies. Not only Apple Music and have DRM. So does iTunes video. In order to remove DRM from it, here recommends M4VGear DRM Media Converter. It is a powerful iTunes video converter which can convert M4V to MP4 or other popular format. In that way, you can freely play iTunes video on non-Apple devices.